When you saw Avatar, I’m sure you remember the clunky, coke-framed 3-D shades you had to wear–you know, the ones with the RealD label that pinched your nose throughout James Cameron’s three-and-a-half hour epic. RealD, the company behind most theaters’ digital projection technology, distributes these free plastic-wrapped shades before each showing. However, eyewear companies such as Look3D and Marchon are moving in on the 3-D glasses market, creating stylish shades for retail. But that’s not a problem for RealD–it just means more profits and advertising. Marchon, which today announced a global licensing agreement with RealD, has developed a patent-pending 3-D lens that enables moviegoers to wear the shades both in and out of theaters. The sunglasses are dual-purpose, meaning they can be used to watch 3-D movies, but do not distort your vision (that is, no blurriness when you’re not staring at a 3-D screen) and are UAV- and UVB-protected. Yet that likely isn’t Marchon’s biggest selling point. From a marketing perspective, it’s more important that Marchon’s innovative 3-D sunglasses are “RealD Certified”–not just “RealD Compatible.” What’s the difference? “Compatible is exactly what we don’t want to be,” corrects Marchon3D president David Johnson. “Compatible just means it can work with. RealD Certified means the viewing experience is optimal.” Johnson reasons that there might be other lens technology that performs “okay” in a 3-D environment, but does not meet “optimized” standards. These knock-off shades won’t have RealD’s endorsement, even if they are compatible and work with RealD cinemas. This shouldn’t be too surprising. THX and Dolby, for example, receive royalties from companies that feature their certifications on products. But Marchon and Look3D aren’t producing complicated audio devices that should require a rigorous certification process like Dolby’s and THX’s. These are 3-D sunglasses, ones using a technology that costs RealD only 65 cents each to make. Is that dirt-cheap lens-tech worthy of needing to pass “RealD’s stringent quality control”? How “stringent” can RealD’s quality control be when they mass-produce box-loads of these one-size-fits-all shades for theaters around the globe? 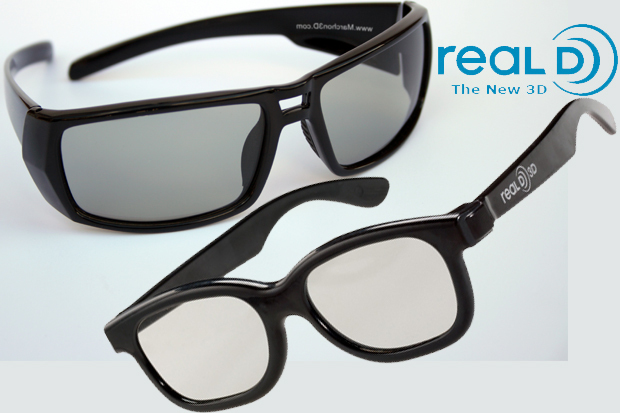 So are RealD “Certified” shades any better than plain-old “Compatible” 3-D glasses? Requests to RealD for comment were not immediately returned. Would you pay more for “RealD Certified” glasses than “RealD Compatible” ones? Heck, would you even pay for 3-D glasses? 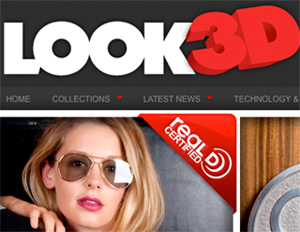 Regardless of the answer, RealD clearly stumbled across a new market for 3-D accessory endorsements and branding, especially as 3-D technology becomes more ubiquitous in movie theaters, on television and computer screens, and other consumer electronics. And with Marchon’s shades priced between $35 to $100 for each pair, with designer and prescription versions costing even more, it’s perhaps no surprise the 3-D market is booming.